Self-awareness is an exercise in whys. Every single person who has ever lived developed personal patterns, behaviours and beliefs. Once those formed few people actually question why? Why do I like oatmeal? …because it reminds of a safe childhood? Why does shopping make me feel better? …because it’s a distraction? Why do remember everyone’s birthday? …because I want to be remembered? You didn’t just accidentally become the person you are today. You choose your behaviours and beliefs. And, there’s a reason for each and every one of them. Exercise: Take a mundane part of your existence today and ask yourself why? Ask yourself why five times to find the root of your behaviour. 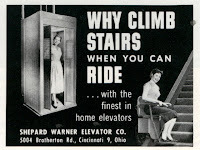 Why do you prefer the stairs to the elevator? Why do you prefer the easier option? -Because my life is so stressful I simply can’t add another minute to my day. Why can’t you fit another minute into your day? -Because I’m already struggling to keep up. -Because I feel like I have to be the best. Because I’ve stopped liking my job. Why do you have to be the best? -Because I’m afraid to be worthless! Suddenly you can understand your choices and potentially make better ones going forward. Every single one of these choices has a root cause. Finding out the causes in your life is a lifelong process in self-awareness. Understanding yourself helps you make better decisions, form healthier reactions, and ultimately possess a happier life.